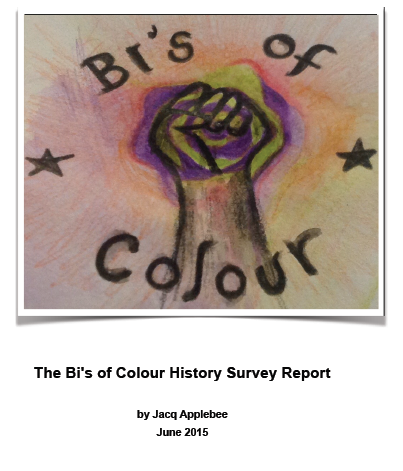 Following the Complicated report on bisexual people’s experiences of services last month BiUK is pleased to be able to announce yet another important piece of grassroots research on bisexual experience: The Bi’s of Colour Survey Report conducted by Jacq Applebee, founder of the Bi’s of Colour group. The experience of bisexual people of colour has been woefully under-researched and neglected to date, with no UK studies focusing on this area. This is despite the fact that we know that people who experience multiple marginalisations through both their sexuality and their race or ethnicity have the worst mental health outcomes due to their experiences of intersecting oppressions, and discrimination on more than one dimension. This is, of course, a particularly vital issue in relation to bisexuality given that bisexual people in general have higher rates of mental health problems than either heterosexual, or lesbian and gay, people. You can download the full report here: Bi’s of Colour Survey Report. The whiteness of offline and online bisexual and LGBT spaces and groups, such that bi’s of colour often feel unwelcome, overly visible, or experience explicit racism and microaggressions, if they do access such spaces. Specific negative experiences such as being hypersexualised (on the basis of both sexuality and race), exoticised and fetishised, or used as the token person of colour to demonstrate the supposed diversity of a community or group. Being presumed straight due to a lack of awareness of the LGBT history within communities of colour, and colonialist assumptions. Feeling excluded from certain spaces due to financial constraints, or because events take places in venues which many people do not feel comfortable in (university settings, or clubs and bars, for example). Some people also spoke positively about their sense of inclusion in certain communities and groups which have been set up (some bisexual spaces, and QTIPOC spaces, for example). The Bi’s of Colour study points to the desperate need for more sustained research in this area and far better resources to address the intersections between sexuality and race and ethnicity in general, and the experiences of bi’s of colour in particular. BiUK hopes to support such moves as much as it can, and we also call upon funded LGBT and mental health organisations to make this a priority. There’s some great mythbusting going on over on Bis of Colour: usefully raising awareness of intersecting prejudices, oppressions and exclusions that impact bisexual people of colour. Bis Of Colour launch event happening this weekend. See Tumblr for details of the event and of this great new group. "Bi people make up the largest part of the LGBT community. Sadly ... their experiences are rarely represented or considered at all." Stonewall, UK. Academic Bi A great international email list for discussions of theory and research related to bisexuality. Bi History Group International facebook group interested in bisexual history. Bi Research Group Email list for those interested in bisexual research, UK based. UK bi activism Mailing list for UK bisexual activists. BiFest A one-day event celebrating bisexuality, for bisexuals and bi-friendly people. Critical Sexology An interdisciplinary seminar series on sexuality research open to all. ICB Information about the international conference on bisexuality. American Institute of Bisexuality US organisation which supports research and education about bisexuality. Bi Media Bisexual news and opinion. BiNetUSA Organisation advocating for bisexual, pansexual, and fluid communities. BiUK National UK organisation for bisexual research and activism. Kinsey Institute Organisation which works towards advancing sexual health and knowledge worldwide. Pink Therapy The place to find LGBTQ friendly therapists and information about therapy with sexual and gender minorities. The Bisexual Index Extremely useful first port of call for all things bisexual in the UK. BCN Britain’s biggest selling bisexual magazine. Bi Magazine AIB online magazine about bisexuality. Journal of Bisexuality The main academic journal on bisexuality. Psychology & Sexuality. Journal advancing research and global perspectives on sexualities. Sexualities Interdisciplinary journal on sexualities. Radical bi Radical bisexual blog. bi.org A web portal for the bisexual community. Bisexual Resource Center US based centre for bisexual resources.